What is PD Pro 4 ? Update July 2012: PD Pro 4 is being retired and is no longer available here. However, all the features found here are available in version 5, and even more in v6, v7 and the new v8 or whatever will follow thereafter. Also, we'll keep these pages alive, so you can still download the free 4.1 update if you already have v4. Besides, there are so many tutorials here, and many techniques shown are still applicable in newer versions too, it would be a shame to loose this section of the site. So enjoy, no matter which version you have at the moment. And contact us if you want to upgrade. PD Pro version 4 is the successor to the acclaimed and award-winning PD Pro Digital Painter 3.x, also known as Project Dogwaffle Professional. It is a paint and animation(!) program for the PC running the Microsoft Windows operating system. You can paint with animations over animations, such as video. We developed PD Pro to enable artists to express free-thinking creativity in a different way, inspired by old-school traditional painting and animation techniques. 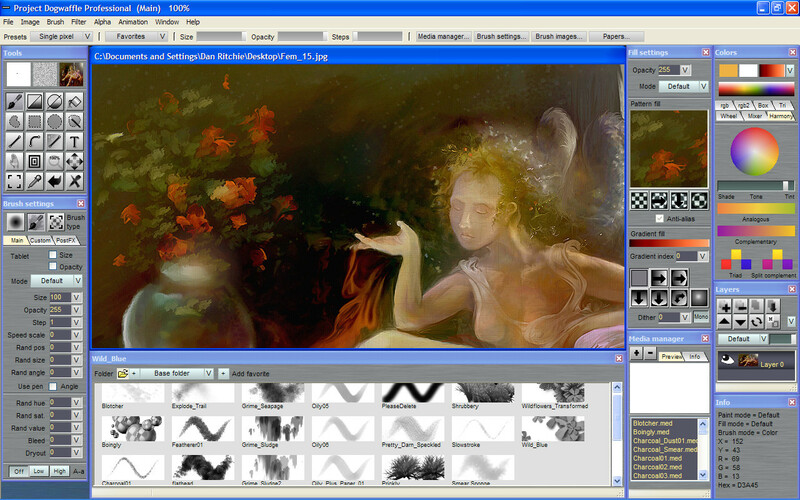 Written by an artist and novelist who himself uses PD Pro on a daily basis, it is now optimized for multi-processors such as Intel Core Duo and AMD X2. Powered by Project Dogwaffle, PD Pro is the top-of-the-line version of several paint and animation tools created by an artist, for the artist in you. Whether you like to dabble and sketch, or do some serious painting or even animation and post work on your videos and 3D rendered animations, PD Pro is made for you, the illustrator, animator, dreamer, student or starving artist. Welcome to artistic nirvana! click to enlarge the screenshot! Still have PD Pro 3.x? This is a new major release, with numerous improvements and changes to the user interface, to higher performance and features. The prior major release, PD Pro 3.0, came in January 2005, and was followed by numerous free updates. We hope to do the same with this major step, following up with even more new features and performance enhancements as well as support for Vista and new hardware to come such as quad-processors and higher-end configurations. We are obsessed with highend performance for professional users, and we hope it will show. For a list of earlier, major and minor releases and former update patches, see what's new in Project Dogwaffle? New user-centric interface makes more of PD Pro's power easier to use, more easily accessible. New favorites list lets you organize and keep your favorite tools in an easy-to-use thumbnail browser. New pigment profiles are much simpler, more flexible, and powerful than color swatches, palette mixers, or other schemes used in the past to represent the color of pigments in traditional painting medias. Pixel profiles are fully integrated, along with newly integrated color tools like the Color harmony tool. Better integration of existing tools, plus dozens of optimizations, tweaks, fixes and improvements requested by users and beta testers. For more details, see What's New in 4.0? Operating System: Windows XP recommended. Earlier versions may also work, such as Windows 98 or 2000, but have not been tested as much. Still, they should work ok.
System Memory: at least 128 MB RAM available, 256 MB or more strongly recommended. 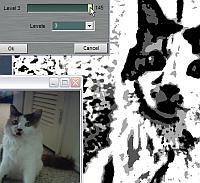 Graphics: a video card set to 1024x768 or higher resolution, and 24-bit or better (truecolor) depth. No 3D acceleration needed, all display rendering is done in software through GDI and MMX. Processor Type: MMX-enabled Intel Pentium 2/3/4 type or AMD equivalent, 1 GHz speed recommended, although it has been seen to work satisfactorily on some slower processors too. PD Pro 4 works great on multi-processor or multi-core systems. IMPORTANT: you need System Administrator privileges to install PD Pro 4. PD Pro is no longer offered by itself. PD Pro and Project Dogwaffle are trademarks of Dan Ritchie. All other names, trademarks or registered trademarks mentioned here are the sole property of their respective owners and only used for identification purposes.